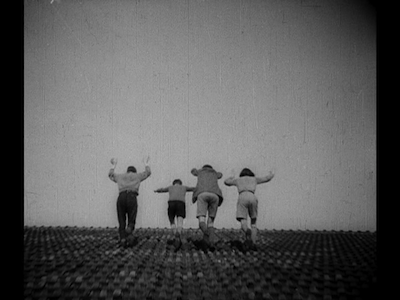 Jean Vigo is one of those interesting artistic figures whose reputation far exceeds his output. He's the kind of name that pops up on lists and scholarly surveys and inspires reactions of "What's the big deal?" 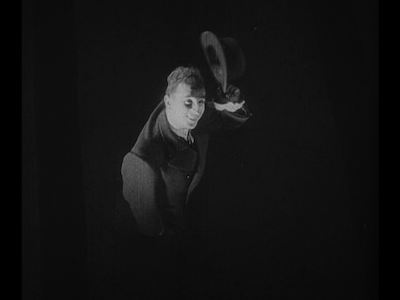 He made only four films between 1929 and 1934, and two of them were under half an hour, another was less than an hour, and only his last, L'Atalante, reached what we would consider a more standard feature length. Again, that's barely anything compared to other equally revered filmmakers. So, what's the big deal? This question is raised, and more than amply answered, in Criterion's The Complete Jean Vigo, a two-DVD set (or single Blu-Ray) collecting all of Vigo's efforts with a movie camera alongside some informative supplemental material. A big deal made of a small career that is a verrrrry big deal indeed. 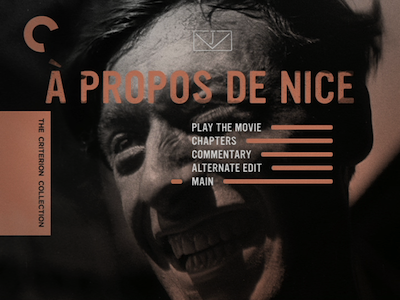 The lead films in the set are the two short subjects Vigo directed, the experimental and fun A propos de Nice (1930, 23 minutes, silent) and Taris (1931, 9 minutes, sound). Both appear to be frivolously produced, with A propos de Nice in particular coming off as a freshman artist being given a new tool and running wild with it. Vigo experiments with double exposure, fades, speed changes, and all manner of other tricks to explore the city of Nice. Most of the footage is shot on the street as documentary; it's in the editing and in some of the staged gags that Vigo draws out a kind of commentary, blending real-life footage with editorial invention. It can be quite funny, such as comparing some exaggerated citizens with similar looks found in nature, or exposing the lingering gaze of a man looking at a pretty girl by showing us what he really wants to see: her clothes disappearing and her silly undergarments exposed, and eventually her completely naked body. Stuffy art has the wind taken out of its sails by seeing a rain puddle gathered in the crotch of a lounging sculpted figure. Yet, Vigo quickly upends these tricks and tricks his audience at the same time. How do we feel when that same playfulness gets serious and shows us the poor and the starving just around the corner from opulence and conspicuous consumption? It's fairly blunt in terms of social comment, but indicative of an emerging cinematic point of view. Few would take their debut effort into such territory. The effect of A propos de Nice is to equalize the common populace. They all share one city, they are of one people, and the one set being selfish and foolish is all the more so next to their neighbor's misery. 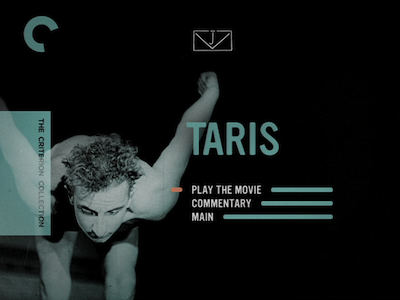 There is a similar equalizing in Taris, in which swimming champion Jean Taris gives a swimming lesson to the viewing audience. Again, Vigo uses experimental effects, including overlapping images, running the film in reverse, and some truly impressive underwater photography. If one wonders where Cocteau got some of his ideas for the many effects shots throughout the Orphic Trilogy, one need look no further. The playful camera work elevates what would otherwise be a standard promo piece for the swimmer, and the ending takes it one step further. Having completed his rather complicated lesson, Taris rises from the pool like some kind of divine being, has his clothes change before our eyes, and exits in a double-exposed shot where he appears to practically walk on water. The glint in his eye suggests, yes, anyone can swim this way, but not anyone can be Jean Taris. There is only one champ. It was two years more before Vigo made the 44-minute film Zéro de conduite (Zero for Conduct) (1933), a whimsical, semi-autobiographical story of a rundown boarding school losing its tyrannical grip on its all-male student body. Returning from a break, the school has a new teacher--or as they call them, "monitors"-- the happy-go-lucky Huguet (Jean Dasté). He is a bit of a joker, and also a fairly competent physical comedian. Dasté glides through a playground scene, breaking into a scrum and grabbing the ball. He does a handstand on his desk to entertain his charges. 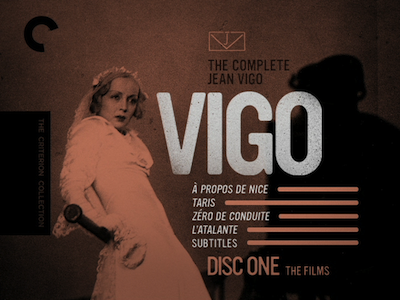 Vigo wrote the script for Zéro de conduite, as well as directing, and though there is a basic plot to the movie, it is structured episodically, like a series of Mack Sennett short subjects stitched together. The kids stage a succession of small rebellions on the way to their final operation. Vigo shoots them in such a way as to capture the magic of youth. 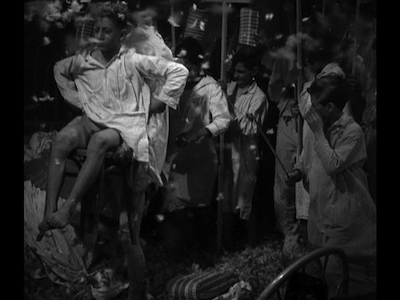 An explosion of pillows creates a storm of feathers, and the boys ride through it in slow motion, buoyed by their own sense of immortality. The director also peppers Zéro de conduite with small touches of surrealism: the diminutive principal with the big beard (Delphin), for instance, whose reflection moves in the mirror independently. Or the boy performing a magic trick, where the ball disappearing is really just Vigo's manipulation behind the camera and in the editing room. Zéro de conduite had trouble with the censors on its initial release due to its frankness regarding disciplinary issues and indiscretions in the school environment. That frankness is also why it still remains so vital after 80 years. It doesn't feel whitewashed, and the problems the boys go through remain relatable while their revenge still provides some wish fulfillment for all of us who ever were unhappy with the teachers and administrators at our school. I wrote a column a couple of months back tracing a link from Hal Ashby to Wes Anderson (and would have included Richard Ayoade's Submarine [review] if I could) and examining the coming-of-age subgenre where imaginative boys cope with the world by unleashing their vivid imaginations. 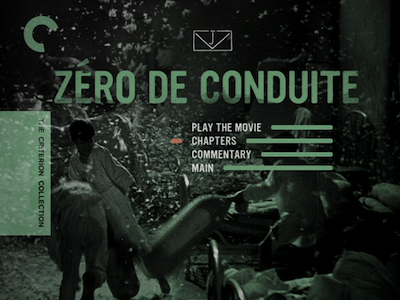 Zéro de conduite has as much a place at the forefront of that tradition as it does with other boy's education movies like If...., The 400 Blows, and Young Törless. On their own, each of those is a pretty impressive legacy for one movie to provide a cornerstone to, but both of them...well, I did say Jean Vigo was a very big deal, didn't I? L'Atalante has been reviewed separately. Read it here.